Synthesis of form and function, the rounded and wrapping design of the T-Line box is designed to integrate into any architecture and living environment. With its attention to details, Musa is perfect to complement any architectural context combining aesthetics and functionality. Awning with free-standing 85 mm cassette available in three versions (Round, Square and Rounded off) and ZIP profile guide. Available both in single-module and multiple-module versions. Sophisticated simplicity and functional precision Premium roller shades are ideal for all sorts of windows. Their extra thin covers minimize the gap between the fabric and the support. 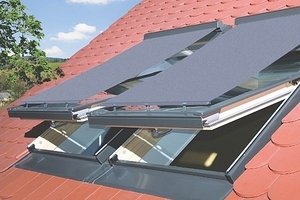 Easy installation system made with top-quality materials. Thanks to its style and durability, the Arion roller shade is the best option for large outdoor surfaces. Arion is the roller shade for large surfaces. ... R 14x1with their rigorous structure, made ? ?malleable by the ropes weaved inside, are the ideal solution to achieve roller blinds for exterior. Exterior blinds are shading units installed on the outside of a structure. They can be mounted above a window, door, bay window or other opening to block or attenuate light, or at an acute angle above an opening or a terrace to create a shaded area. The several types differ by application and opening system. Among others, there are roller blinds, horizontal slat units, such as Venetian blinds and awning models with folding arms. Choice will depend on required function, whether to block light from a window or shade an area, and the planned location, such as a door, a window or a terrace. Carefully examine the quality of the materials, both shading elements and frame, to ensure efficacy and extended life. The operating system can be manual or automatic.